This week, April 9th to the 11th, 2019, nearly 1,700 avid Zoho users made the trek to Austin, Texas to hear the latest news from Zoho executives, employees, partners and fellow users at the company's annual event known as Zoholics. Zoho is the maker of an all-in-one cloud-based software solution, Zoho One, which includes 40+ applications that a company can use to help run its business. The Zoho executives like to call it: "the operating system for business." The city of Austin, known for keeping it weird, was announced as Zoho's next headquarters; which is appropriate, because during the Zoholics event, Zoho CEO Sridhar Vembu made it quite clear that his company also has a very distinct personality and culture, calling it "an unusual company." And indeed, it is, but in a very positive way. Zoho executives were joined on stage by Austin Mayor, Steve Adler, to make the HQ move announcement to the crowd. As part of the announcement, the company said it had purchased 375 acres of property in southeast Austin, where they could build their new 100,000 square foot headquarter campus. The area is located about 5 miles away from the Austin airport, near Kellam Road and State Highway 71. It will ultimately become home to about 500 Zoho employees and it should be completed sometime by 2021. This "unusual" company will also plan to expand its Zoho University program, a technology school for high school graduates which currently operates in India. According to Vembu, kids shouldn't have to become a hundred thousand dollars in debt to get a four-year degree that ultimately provides very little actual real-world experience. Instead, Zoho likes to train individuals, usually kids with underprivileged backgrounds, to give them a skill set they can use. They train them, pay them for their time while learning, and then hire them for a job when they graduate. These students come out debt free, with money in their pockets, and with a skill that can translate into a job in the industry. "We create our own talent with Zoho University," said Vembu. And the company is able to acquire talent from a pool of people that end up with a clear understanding of the way things work, and, a respect for the culture that Zoho has created. Initially, it sounds like the Zoho University program will be more of a beta or done on a smaller scale endeavor in Austin compared to its sibling University in India. But I would expect things to pick up pace and translate into something positive, for both the local community and the company at large, quickly. The plan is to start out by working closely with independent schools and community colleges in the Austin area to help educate local students and hopefully provide a path to the future. Where the campus in India offers deep technical training, the Austin campus will instead focus on business administration and marketing. 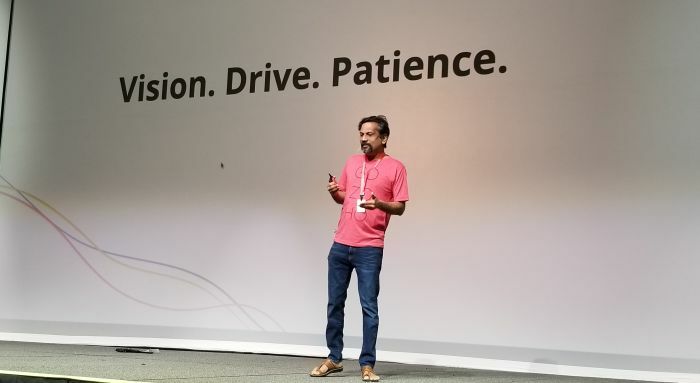 Zoho's corporate culture has three main ingredients: vision, drive and patience. "All of the vision in the world doesn't matter if you don't have the patience and execution," Vembu told audience members. As part of the keeping it weird or unusual, Vembu said his company is in a positive place where he and his staff are afforded a great deal of patience because the company is privately owned and debt free. The 23-year young company has steered clear from taking venture capital funds, and that, he believes, is central to the company's success and maintaining their corporate culture and values. Without having to worry about reporting quarterly numbers to Wall Street, Zoho can focus on its employees, partners, customers and products. By keeping its product costs low (the Zoho One product suite is $30 per user per month), they may be, as they laughed about it on stage, "leaving money on the table." But that's okay, and it seems to be a big part of their culture. The customers in attendance at Zoholics19 seemed truly grateful for that. Zoho executives also stated the company is in it for the long haul. The team has built a lifestyle company that is providing high value and great products to businesses. And as Vembu said on stage, "Why would we race to the exit when you are doing something you love?" As the company is privately held, they do not disclose financials. However, Vijay Sundaram, Zoho's Chief Strategy Officer, did tell reporters on site at this week's conference that the company is growing, and it continues to be profitable. Sundaram shared a company growth chart that calculated the positive rise from a baseline of 100 in 2012, increasing at a 5 year compound annual growth rate of 39 percent, and rising from 100 in 2012 to 703 in 2018. The company also announced their user base has surged to 45 million users worldwide, across 180 countries. And they plan to continue to expand and grow into other markets. While sales in the US are growing, they aren't doing so as fast as some other geographic areas. Sundaram said the Americas make up 53 percent of revenue, with EMEA coming in second at 29 percent and APAC reaching 17 percent. Zoho is aggressively expanding in developing countries where they see a logical market for their "operating system for business" solution, expanding last year alone into Singapore, Mexico, Australia, Netherlands, and United Arab Emirates. The company plans to continue to grow, continue to expand, and continue to keep things "unusual," and yes weird, as they transition themselves into yet another Austin-based software company that has migrated away from the bay area of California.